A rounded, compact shrub with dark green lustrous leaves. Summer flowers are bright red in alkaline soil and blue-purple in acid soil with, serrated edges on each petal. It needs moist soil and prefers partial sun. 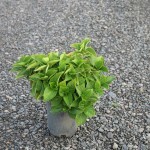 Great for use in shade gardens, shrub borders, mass plantings or as a focal point.